400 pages | 7 B/W Illus. The public debate over civilian use of drones is intensifying. Variously called "unmanned aircraft systems", "unmanned aerial vehicles", "remotely piloted aircraft", or simply "drones", they are available for purchase by anyone for a few hundred to a few thousand dollars. They have strikingly useful capabilities. They can carry high-definition video cameras, infrared imaging equipment, sensors for aerial surveying and mapping. They can stream their video in real time. They have GPS, inertial guidance, magnetic compasses, altimeters, and sonic ground sensors that permit them to fly a preprogrammed flightplan, take off and land autonomously, hover and orbit autonomously with the flick of a switch on the DRone Operator’s ("DROPs") console. The benefits they can confer on law enforcement, journalism, land-use planning, real estate sales, critical infrastructure protection and environmental preservation activities are obvious. However, their proliferation in response to these demands will present substantial risks to aviation safety. How to ensure the safety of drone operations perplexes aviation regulators around the world. They are inexpensive consumer products, unsuited for traditional requirements for manned aircraft costing hundreds of thousands or millions of dollars and flown only by licensed pilots who have dedicated significant parts of their lives and their wealth to obtaining licenses. Regulatory agencies in Europe and Asia are ahead of US regulators in creating spaces for commercial use. Over the next several years, legal requirements must be crystallized, existing operators of helicopter and airplanes must refine their policy positions and their business plans to take the new technologies into account, and all businesses from the smallest entrepreneur to large conglomerates must decide whether and how to use them. Domesticating Drones offers rigorous engineering, economics, legal and policy theory and doctrine on this important and far-reaching development within aviation. 8. Regulatory philosophies and constraints in the U.S.
9. 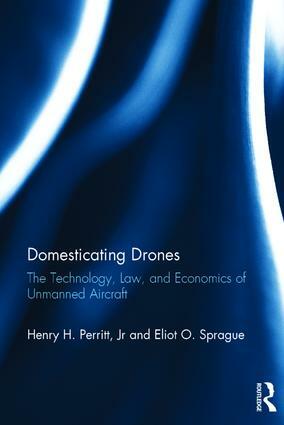 Allowing only "law–abiding drones"
As soon as the final FAA regulations are published, the authors will provide the text of the regulation and an analysis on www.domesticatingdrones.com, with no additional charge. Henry H. Perritt, Jr is a Professor of Law and former Dean, Chicago-Kent College of Law, the law school of Illinois Institute of Technology, which he served as Vice President and Chief Academic Officer for the Downtown Campus from 1997 to 2002. He is a private helicopter and airplane pilot. Mr Perritt received his bachelors of science degree in aeronautics and astronautics from MIT, his masters degree in management from MIT’s Sloan School of Management in 1970, and his juris doctor degree from Georgetown University Law Center in 1975. He worked as an application engineer and senior sales planner for Lockheed Aircraft Corporation from 1968 to 1971, and as an application engineer and senior sales planner for Lockheed Aircraft Corporation from 1968 to 1971. Mr Perritt has written twenty books and nearly a hundred articles, many of them on administrative law and law and technology. He is a member of the bar of Virginia (inactive), Pennsylvania (inactive), the District of Columbia, Maryland, Illinois, and the Supreme Court of the United States. Eliot O. Sprague is a Professional ENG helicopter pilot; Director of Market Development and Commercial Pilot, AM Air Service; and a helicopter flight instructor, Midwestern Helicopter. He is a member of the board of directors of Midwest Helicopter Association. Mr Sprague is a graduate of Hillsboro Aviation flight school and holds helicopter CFI-I, CFI, and commercial pilot ratings, and a commercial airplane rating. Mr Sprague taught Mr Perritt how to fly helicopters. Together Perritt and Sprague manage Modovolate Aviation, LCC, which conducts drone research, evaluation, demonstration, and education programs. They have co-authored a law review article on drones, to be published by the Vanderbilt Entertainment and Technology Law Journal, and several magazine articles, published within aviation magazines.